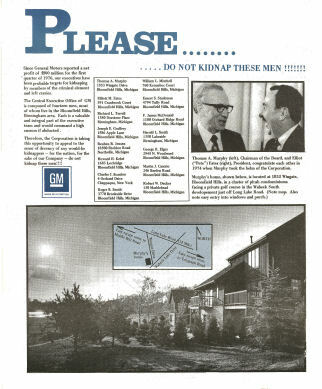 Since General Motors reported a net profit of $300 million for the first quarter of 1976, our executives have been probable targets for kidnapping by members of the criminal element and left crazies. The Central Executive Office of GM is composed of fourteen men, most of whom live in the Bloomfield Hills, Birmingham area. Each is a valuable and integral part of the executive team and would command a high ransom if abducted. Therefore, the Corporation is taking this opportunity to appeal to the sense of decency of any would-be kidnappers—for the nation, for the sake of our Company—do not kidnap these men!!!! Photo caption: Thomas A. Murphy (left), Chairman of the Board, and Elliot (“Pete”) Estes (right), President, congratulate each other in 1974, when Murphy took the helm of the Corporation.